Women and children arrive in the Bentiu Protection of Civilians site for internally displaced people, in Unity State, South Sudan. United Nations Secretary-General Ban Ki-moon today released $100 million from the UN Central Emergency Response Fund (CERF) for severely underfunded aid operations in nine neglected emergencies. The funds will enable life-saving help for millions of people forced from their homes in Central and Eastern Africa, those affected by conflict and food insecurity in Libya and Mali, and the most vulnerable and at risk of malnutrition in the Democratic People’s Republic of Korea. According to the UN, CERF is one of the fastest and most effective ways to support rapid humanitarian response. The Fund pools donor contributions into a single fund so money is available to start or continue urgent relief work anywhere in the world at the onset of emergencies and for crises that have not attracted sufficient funding. Today, some $64 million from the CERF allocation will allow humanitarian partners to respond to the displacement crises in Central and Eastern Africa caused by conflict and violence in South Sudan, Burundi and the Democratic Republic of the Congo. Urgently needed funds will help an estimated 1.7 million refugees, internally displaced people and host communities in Burundi, Ethiopia, Kenya, Sudan, Tanzania, and Uganda. A further $28 million will help relief agencies address the humanitarian needs of up to 350,000 people affected by conflict and food insecurity in Libya and in Mali, where an estimated 300,000 people will be assisted, especially in the North. An allocation of $8 million will support urgent life-saving humanitarian assistance for more than 2.2 million vulnerable people in DPR Korea, including 1.8 million children who need urgent nutrition assistance. “With so many crises competing for attention around the world many people in need are forgotten,” said the UN Emergency Relief Coordinator, Stephen O’Brien. Since 2006, 125 UN Member States and observers, private-sector donors and regional governments have supported the Fund. To date, CERF has allocated almost $4.2 billion for humanitarian operations in 94 countries and territories. 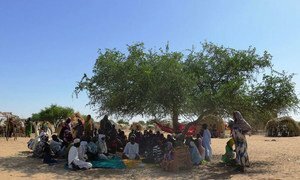 With the Lake Chad Basin now the fastest-growing displacement crisis in Africa as 2.7 million people, 1.5 million of them children, have been uprooted by Boko Haram terrorists, the United Nations emergency fund has announced new grants of $31 million to four countries in the region.